Change will be high on the agenda when the YMCA Youth Parliament sits this week. For three days, Youth Parliamentarians will be debating issues of importance to young people in the Legislative Assembly and Legislative Council Chambers of Parliament House in Spring Street, Melbourne. This year there are 20 bills on a range of topics including health, education and law and order. The YMCA Youth Parliament has a rich history of providing an avenue for young people to gain experience and skills in debate and critical thinking. In 1985, the State Director of the Victorian YMCA, Dave Davis, put forward the idea of developing and presenting a Youth Parliament to a group of young people from around Victoria who represented their local YMCAs. Victoria’s first Youth Parliament was held in the Legislative Council of Parliament House in September 1987. Having chaired Youth Parliament in the past, Youth Affairs Minister Jenny Mikakos said she is looking forward to opening and closing this year’s Youth Parliament and closely following the debates. “I am always struck by the passion and skill of Youth Parliament participants and the high standard of debate and political engagement,” she said. If voted through and passed by the members of the House, Bills are given assent by the Youth Governor of Victoria. Bills are then handed to the Government to be considered by the relevant Government Ministers. Ms Mikakos said that once Youth parliament finishes for the year it will be her responsibility to share the Bills that have passed with the relevant minister. The 2015 Youth Governor, Nada Aldobasic said the benefits of the program stretch far beyond the participants. “We get to bring in 120 young people from around Victoria, from all different councils, all different communities,” she said. “These are 120 young people that get to be empowered and stand up knowing they can believe in something they want to and have their voices heard. 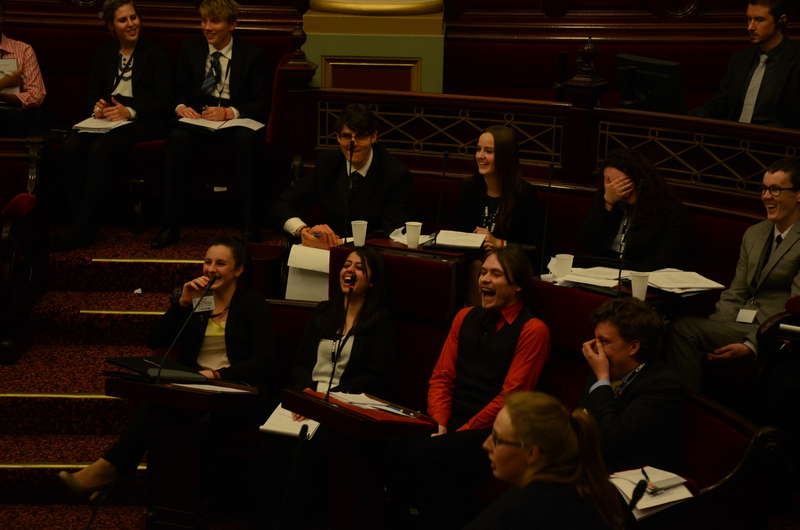 The Youth Parliament is open to the general public and friends, families, teachers and sponsors of the 20 teams from around Victoria are encouraged to go along during the sitting days to experience the high quality of debate. The 2015 Youth Parliament will be sitting on Monday June 29, Tuesday June 30 and Thursday July 2, 9.00am – 4.00pm. Posted on June 28, 2015 June 28, 2015 by vicpressgalleryPosted in 2015, Youth, Youth ParliamentTagged 2015, YMCA Victoria, Youth, Youth Parliament. Previous Previous post: What do young people really care about?